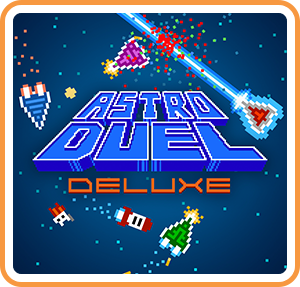 Astro Duel Deluxe includes new features and gameplay created for the Nintendo Switch! Play anywhere – On the TV, on the go, or even face up on a table or floor! Wacky "Touch" mode – Ships can only turn in one direction! Run over pilots in "Pilot Hunters" mode, battle for the most kills in "Ship Hunters," or join forces in "Team Deathmatch"